This Mellow Yellow Monday, it's a great honor to feature one of the Filipino's finest and the best. 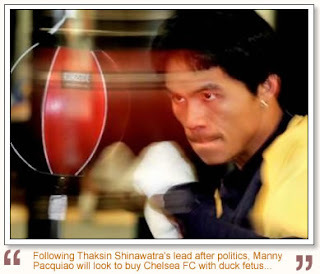 Let the drum rolls for EMMANUEL "Manny" Pacquiao a.k.a. PACMAN. He once again proves to the whole world that he deserves to be called People's Champ! His record breaking performance overwhelms the boxing arena and which makes the Filipinos more proud of him. He's been featured in TIME's Magazine. His latest victory against the Puerto Rican pride, Miguel Cotto makes the whole world wanting for more and this time they're asking for Floyd Mayweather Jr. Hmmm... it's another bout that the entire world is looking forward to. I'm just hoping for Manny to use all his winning benefits into good use and may his victory will keep his feet firm on the ground. Above all, he must not forget to thank God for the strength and wisdom that was bestowed upon him. Kudos to you PACMAN! Proud to be Pinoy. Happy MYM!